Failure Analysis of BGAs - SEM Lab Inc.
Failure analysis of BGA devices can be both expensive and daunting. The primary advantage of BGA packaging is the packing of large numbers, 400-500+, of I/O pins into a relatively small area. The high number of I/O is also what makes the failure analysis task so complex. This document attempts to describe several BGA failure modes and analysis approaches that can be performed with a limited number of analytical tools (e.g. 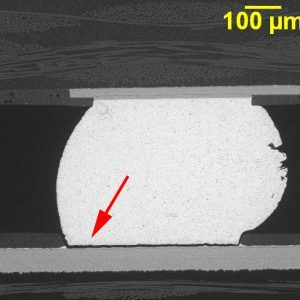 DMM, microsectioning, and SEM/EDS). The document also describes a number of other more advanced approaches where the limited tools are not enough to identify the failure cause. To see SEM images of failed BGAs visit our Failure Analysis of BGAs page.